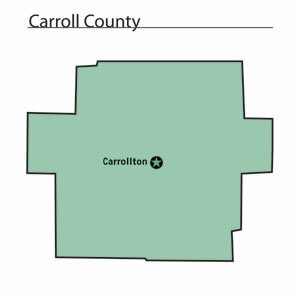 The Ohio government authorized the creation of Carroll County on December 25, 1832. The county was named for Charles Carroll, the last surviving signer of the Declaration of Independence. Carroll died in 1833. The county was originally part of Columbiana County. The Fighting McCooks, a family of Union Army volunteers during the American Civil War, resided in the county. One of the McCooks' homes is now an Ohio Historical Society site. Approximately ten percent of Carroll County's residents earn their livings through farming. Manufacturing establishments, sales positions, and service industries are the three largest, non-agricultural employers in the county. Coal mining used to be a major industry in the county, but companies have extracted most of the coal through strip mining. In 1999, the per capita income for Carroll County residents was approximately twenty-one thousand dollars. Almost eleven percent of the county's residents lived in poverty. This percentage is relatively small in comparison to most other counties in Appalachian Ohio. Most voters in Carroll County claim to be independents, yet in recent years, they have supported Republican Party candidates at the national level.